The Wynwood Yard’s grand finale season ushers in the grandest of all Pub Crawl Pick Up events we have ever hosted! This April 7th, the very last Pub Crawl Pick Up at our Wynwood location followed by The Yard’s International Beer Day Festival (International Beer Day Festival entry free for Pub Crawl Pick Up holders!!) will bring together community partners, organizations, local breweries and restaurants that have made past community clean ups fun, impactful and delicious. Join us, longtime Pub Crawl Pick Up partner, Debris Free Oceans, plus our featured partner for April: Rescue a Reef, along with an impressive cohort of community organizations like Miami Water Keeper, AIM, and The Full Edit, from 3 p.m. to 5 p.m. on a mission to beautify Wynwood while also making an impact on Biscayne Bay and Miami’s beaches. Meet at 2:30 p.m. at The Wynwood Yard to sign in and enjoy an initial brew or kombucha, meet fellow cleaner uppers, and learn about DFO and featured participating non-profit. You’ll travel through the neighborhood, cleaning up as you go and making a pit stop for a bite at Charlie’s Vegan Tacos on our way back to The Wynwood Yard, where we’ll join the International Beer Day Festival (your $20 ticket includes vouchers for beer samples at the festival). Also, $5 of your $20 ticket will benefit Debris Free Oceans and another $5 will benefit a participating non-profit of your choice. PLEASE NOTE: In honor of Earth Month, single-use plastic cups are banned from the grand finale Pub Crawl Pick Up and International Beer Day Festival events. Please bring your own reusable cup or purchase a Klean Kanteen cup at The Wynwood Yard for $10. Cost: $15 for adults; $12 for seniors and $7 for students (through age 22 with a valid student ID). Admission is always free for members, military and children ages six and under. Presented by History Fort Lauderdale, bringing the stories of our diverse community to life through engaging educational experiences, innovative cultural exhibits, research and preservation of artifacts. Residents and visitors to Fort Lauderdale are invited to explore the city’s rich past that is housed in historic buildings on a lushly landscaped campus – the History Museum of Fort Lauderdale situated in the 1905 New River Inn, the 1907 Pioneer House Museum, the 1899 Ivy Cromartie Schoolhouse Museum and the Hoch Research Library, South Florida’s foremost history center housing print resources and newspapers from 1910 – present plus 400,000 archival photos, 2,500 maps and 5,000 architectural blueprints. Museum hours are Monday – Friday from noon – 4 p.m. and Saturdays and Sundays from 9:30 a.m. – 4 p.m. History Fort Lauderdale is a nonprofit agency supported by memberships, grants and charitable contributions. Join The Wynwood Yard and partners Debris Free Oceans and AIM on this fun mission to beautify Wynwood while also making an impact on Biscayne Bay and Miami’s beaches. Inland trash eventually makes its way from city centers to our waterways, harming marine life and water quality. This month, we’re fulfilling multipe New Years resolutions! Tapping into your healthy goals with a yoga & meditation segment to kick off the clean up with intention and balance, and an optional nutrition talk and mini della bowls to finish your clean-up mission. This month’s pick-up will feature Non-Prophet kombucha, brews at Veza Sur, vegan tacos & beer at Coyo Taco, and plant-based mini bowls at della bowls. You’ll also feel good about starting 2019 off with community service and contributing to a cleaner community and planet. Kudos to you! We will begin our mission at The Wynwood Yard. We’ll enjoy a kombucha, meet our fellow cleaner uppers, and learn about DFO and AIM. You’ll travel through the neighborhood, cleaning up as you go, and a make pit stop at Coyo Taco for vegan tacos and a brew. Finish at The Wynwood Yard with one final beer and bite. Included in the $20 participation fee is a reusable KleanKanteen cup which will get you a complimentary drink at the entry to AND at the completion of the clean up (PLUS $1 back on every draft beer purchased ever at The Bar at The Yard forever thereafter), plus trash bags, gloves, pickers, and directions. Aim is a nonprofit after school program that provides free yoga and educational programming to high school students. Working in conjunction with Miami-Dade County Public Schools, Aim strives to help young people thrive. Through yoga, meditation and exercises that practice social and emotional awareness, students increase their self awareness and self management, relationship skills, and responsible decision-making. At Aim, they are exposed to healthy lifestyle choices, meet with mentors, and prepare for what’s next in their lives. Need an excuse to entertain the entire family on a Sunday? Head to Pinecrest Gardens’ award-winning Farmers Market to shop the season’s bounty, to explore the dynamic botanic gardens and to view the Antarctic Ice Paintings: Global Coastlines and Underwater HOA exhibit by prominent environmental artist, Xavier Cortada. While there, visitors can learn about how to become climate change problem-solvers in their community. Be sure to pick-up an “Underwater HOA” marker artistically designed by Cortada, who has implemented a Miami-Dade County wide participatory art project to coincide with Art Basel. The Underwater HOA project aims to bring awareness to sea-level rise in South Florida and beyond and engage citizens to prepare for the chaos to come. There is a limited supply of Underwater Markers, which will be distributed from 10:00 a.m. to 5:00 p.m. on Sunday, December 2 at Pinecrest Gardens, 11000 Red Road, Pinecrest, FL 33156. The Farmers Market operates on Sundays from 9:00 a.m. until 2:00 p.m. Admission is free. For more information about the Underwater HOA exhibit, call 305-669-6990 or visit www.underwaterhoa.com. The Wynwood Yard is participating in My Miami Story in partnership with The Miami Foundation on Tuesday, October 23rd fostering and providing a space for “conversations that spark change”. This event is on rain or shine and free with RSVP. On August 18th from 9:30 am to 5:00 pm Better Me Bootcamp will be holding a High-Intensity Circuit Training class in Eden Roc’s very own backyard along with a pro-environment activation for a complete holistic experience. The Better Me Movement will be collecting all types of batteries at the event to be able to recycle them. After the workout, guests can enjoy a dip in the pool! Join adventurous Emma, Oliver the Octopus, and children’s author Kim Cameron for a day of ocean-themed fun at Haulover Park! Solve a mysterious riddle to win special prizes, meet your favorite Seaper Powers characters, and get your very own book signed by the author! It’s all part of Haulover Park’s Sea Life Festival, featuring kite-flying, food trucks, live music, bounce houses, games, and more. Families of all ages will love experiencing the magic of Seaper Powers! The Riddle Walk takes place from 6:30-7:30 p.m. Meet and greet your favorite characters starting at 7:30! Festival admission and parking are free! Seaper Powers is a whimsical series of illustrated adventure books for children ages 5-9. The books take young readers on a magical journey of imagination and ocean adventure, along the way communicating positive messages about self-confidence, friendship, and environmental conservation. Learn more at www.seaperpowers.com! 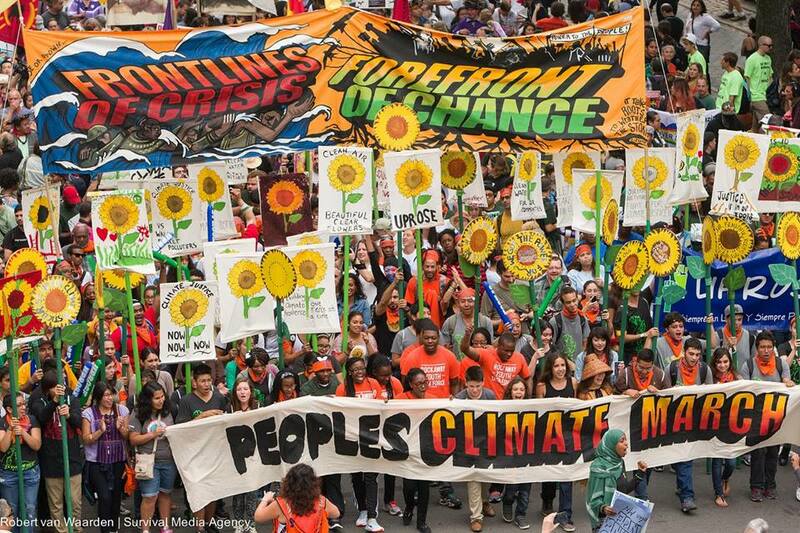 Music and Change: How we can use art and music to inspire change and environmental action. This event will include an artist happy hour and jam session for those interested. As well as a discussion on how we can use art and music to engage the community. If you woud like to do a small performance, please reach out to Salome Garcia at 786-387-5111. The Wynwood Yard along with community partners 4Oceans and Debris Free Oceans host June’s edition of Keg & Klean, a fun neighborhood mission to beautify Wynwood while also making an impact on Biscayne Bay and our Miami beaches where trash eventually makes its way from city centers, harming marine life and water quality. Included in the $20 participation fee is a reusable Klean Kanteen cup which gets you a complimentary draft beer at entry to the clean up (PLUS $1 off every draft beer purchased ever at The Bar at The Yard forever after), trash bags, gloves and directions. If you’re a veteran kleaner-upper and already have a keg + klean cup, you can knock $5 off that participation fee. In honor of World Oceans Day on June 8th, Eden Roc Miami Beach and environmentally friendly men’s swimwear line The Tropics join forces for an epic beach cleanup! 1 Hotel South Beach will kick off World Oceans Day with a Beach Clean Up on Friday, June 8th from 10 a.m. to 12 p.m. Hotel guests and those who are looking to make a difference and be rewarded for it are welcome to join together for a morning of service and fun. After the beach clean up, enjoy a complimentary cocktail from the sponsor, Titos at the luxurious South Beach hotel. Making a difference while sipping some booze on 1 Hotel South Beach’s private beach? Nothing better. The group meeting spot is at the hotel’s beach entrance on 24th Street, and supplies will be provided. Join Chef Julie Frans for leisurely garden tours where you’ll learn tips about how to use fresh harvested greens and herbs in your daily cooking. Sip on a complimentary garden-to-bar cocktail while you stroll and watch how effortlessly Chef Julie harvest fresh, flavor-packed lettuces, herbs and edible flowers straight from the garden for a beautiful and delicious salad you can enjoy afterward. You’ll also receive a discount card for dinner at CHARCOAL Garden Bar + Grill, as well as one for della bowls. Walk for the Apes will be the largest outdoor 5k walk in Miami raising funds for the Center for Great Apes, a 501c nonprofit chimpanzee and orangutan rescue center. This will be a unique opportunity to take part in this historical animal advocacy movement on its first year of inception. The Under the Sun Art & Music Festival kicks off to the general public free of charge on Sunday, September 30, 2018 at Tropical Park. Local artists will display and showcase their art in a beautiful outdoor setting. Live music will be provided by local high school bands. The art festival is perfect for the entire family. It is considered the first art festival of the season. Besides the unique art and live music, food trucks will present mouthwatering lunch options. It’s a can’t-miss event for any art lover who wants to get their hands on great art in South Florida! Kids, join the cooking-with-kids pros from Skills for a fun, hands-on cooking class at Earth Day at The Wynwood Yard! You’ll harvest organic herbs from the garden and use them to make healthy, easy-peasy scissor salsa and a delicious pesto sauce you can take home with you! Parents, while this workshop is geared towards kids 6 and above, your little ones are welcome to join, as long as they are under parental supervision. Limited spaces available! Join us for a culinary adventure at this third of three cooking demos at The Wynwood Yard’s Earth Day Festival on April 21st.Learn from the pros at Miami Smokers how to make the most out of your meat. The focus of the class will be on the tip to tail techniques; using the whole animal to create meals essentially reducing waste. You’ll enjoy samples of the food created. Snag your tickets and check out the menu in the link. Join us for a culinary adventure at this first of three cooking demos at The Wynwood Yard’s Earth Day Festival on April 21st. Food artist, cookbook author, and creator of cookies beloved by Miami, Pamela Wasabi teaches the plant-based class where she debuts her new GF pancake mix! Learn how to make quick and simple recipes you can create at home, and how to approach “vegan substitute” ingredients. Get tips and tricks for recreating traditional recipes so that you can make them into your own plant-based recipes. Visit the link to reserve your spot and take a peek at the entire menu. 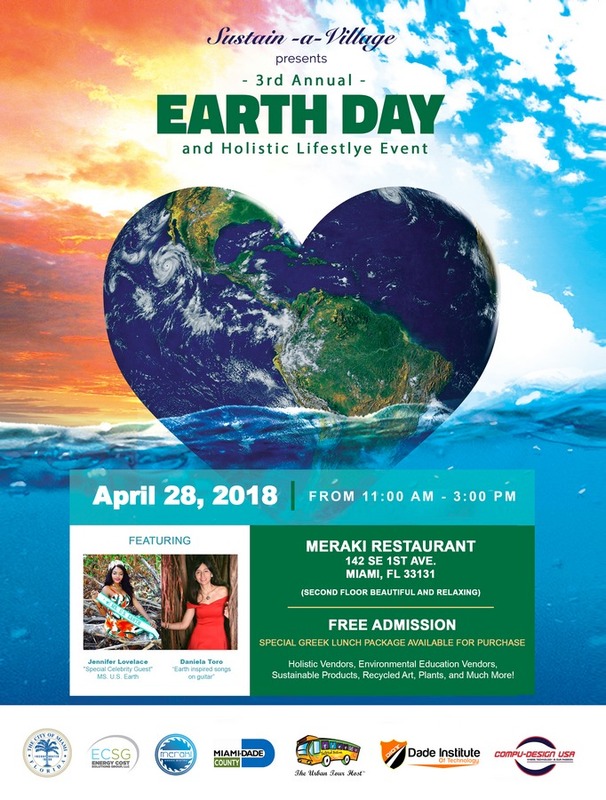 This Earth Day special edition of The Yard’s Community Cleanup monthly event is presented in collaboration with Surfrider Miami and Debris Free Oceans. Meet at The Yard at 4 p.m. and get ready for a fun neighborhood mission to beautify Wynwood while also making an impact on Biscayne Bay and our Miami beaches where trash eventually makes its way from city centers, harming marine life and water quality. Included in the $20 participation fee is a reusable Klean Kanteen cup which will get you a complimentary draft beer at entry to the clean up (PLUS $1 off every draft beer purchased ever at The Bar at The Yard forever after), trash bags, gloves and directions. You’ll travel through the neighborhood, cleaning up as you go, making pit stops for sponsored drinks, bites, and insight at Division Surf & Skate Shop, Concrete Beach Brewery, and R House Wynwood. Finish the cleaning, eating and mingling at The Yard with more refreshments. MCAD promotes awareness and appreciation of the ways in which architecture and urban design influence and enhance the quality of life in our community. The new signature event recognizes individuals who have accomplished much to better our urban landscape. Get your green on with fun, hands-on, educational workshops and activities for the entire family including a plant-based baking cooking class with Chef Pamela Wasabi and a make your own easy and tasty trail mix in recycled #5 containers by Whole Foods Market. Bring your old clothing to up-cycle it into bracelets with The Full Edit, and learn about planting medicinal plants in Earth Mother’s Herbalist Gardening Workshop. Meet local organizations and small businesses that are making big impacts, like Surfrider Foundation, Debris Free Oceans, and Urban Green Works, as they share tips at their informational booths. Shop earth-friendly products from local producers and artisans like Respect the Fin, make flower crowns with Zoom Blooms, and be sure to stop by the photo booth to get your Earth Day pic in front of the Andromeda Studios Living Wall. Choose from three options of $6 beers from Concrete Beach, Saltwater Brewing, and South Beach Brewing, with a portion of proceeds going back to an environmental focused non profit. All ages are welcome! Admission is free. Seavitt is an associate professor or landscape architecture at City College of New York and principal of Catherine Seavitt Studio. She is invited as a Cejas Scholar. Her research explores adaptation to climate change in urban environments and the novel transformation of landscape restoration practices. 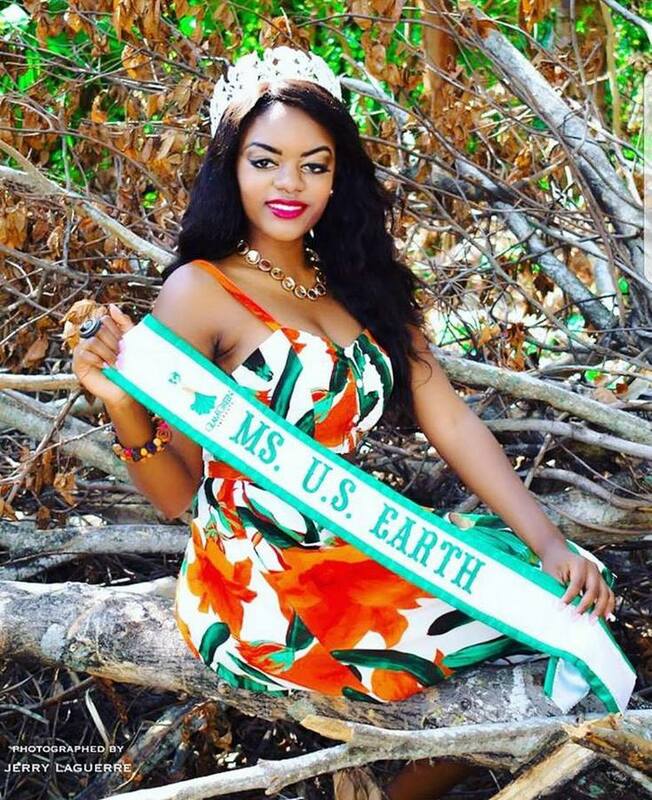 She is also interested in the intersection of political power, environmental activism, and public health, particularly seen through the design of public space and policy. Her recent books include Structures of Coastal Resilience (Island Press, 2018); Depositions: Roberto Burle Marx and Public Landscapes under Dictatorship (University of Texas Press, 2018); and Corridor Workbook (Regional Plan Association, 2017). Families will have a whale of a time at the 3rd annual Earth Day celebration hosted by the Town of Surfside. Come connect, play, and celebrate beautiful Mother Earth alongside family and friends, while learning about conservation and ways to protect the planet. Festivities to include a community project using recycled water bottles to create a large jellyfish, a rescue bird release in partnership with Pelican Harbor Seabird Station, in addition to turtle-y awesome arts & crafts, henna tattoo artist, light refreshments, DJ and T-shirt giveaway. At this educational green event, participants will help kickoff turtle nesting season, which typically takes place from May – October in Surfside. Miami-Dade County also will be on-site to conduct a shower head and light bulb exchange. Participants are encouraged to bring an old showerhead and/or lightbulb in exchange for a maximum of two high-efficiency showerhead models and two incandescent bulbs for two CFL bulbs, per household. Wyland National Mayor’s Challenge for Conservation. An eco-conscious community, Surfside recently banned the use of plastic straws and expanded polystyrene food service articles; adopted a solar photovoltaic incentive for residents and area businesses; passed a zero omission/clean energy bus goal resolution and hosted a beach cleanup, among a number of sustainable initiatives. The Town of Surfside is a beautiful oceanfront community located in South Florida’s subtropical paradise. It encompasses the area from 87th Terrace to 96th Street, between the City of Miami Beach to the South and the Village of Bal Harbour to the North. Incorporated in 1935, Surfside is home to nearly 6,000 residents and features a tranquil and charming residential neighborhood, multi-family condominium and apartment buildings, and a traditional “home town” business district. Surfside is also a premier travel destination, offering a wide range of award-winning restaurants, luxurious resorts and spas, shopping, and leisure activities for visitors year-round. For more information, contact Surfside’s Parks & Recreation Department at 305-866-3635 or visit www.townofsurfsidefl.gov. At Grillin’s Kitchen Lab, South Florida’s premier pit masters will take center stage to smoke the competition out at this year’s BBQ Cook Off. In between cooking demos, their saucy host will perform a ROAST comedy show. In addition, they will pit two local backyard chefs and their best burger recipe at Miami’s Best Backyard Burger competition. Those interested in participating should register their recipe at WynwoodBBQFest.com. For the first time ever, Grillin N’ Chillin will have a Veggie Corner, where Miami’s top, vegetarian and vegan eateries will showcase their menu. While kids enjoy the Family Fun Zone, adults can relax at The Pit, a pop-up BBQ-infused sports bar that will have bars and live music, or they can “Get Lost in the Sauce” at the huge sauce bar. Be sure to pick up some SWARM Bar Bucks online to save money on mixed drinks (($25 for $45 value at the bar). Also, bring your furry pups, because the Hot Dogz playground will have plenty of treats for them to enjoy. In addition, the Animal Adoption Truck will be on site for those looking to take home a pet. To round off a day of good BBQ, Grillin N’ Chillin has compiled a number of popular dessert vendors who will be ready to satisfy your sweet tooth. Perhaps the coolest feature at this year’s Grillin N’ Chillin is both the humanitarian and ecological stand that it’s going to take. SWARM, the creators of this festival, will set up a Miami Rescue Mission tent, so that people can sponsor a meal for a hungry person. In addition, it will be “going green” by partnering with Debris Free Oceans to become a zero-waste event. “To date, no other event in South Florida has taken this into consideration, so we’re excited to have proper sorting, composting and recycling stations in addition to other green efforts,” says Tony Albelo, CEO at SWARM. To save money at the bar, pick up some SWARM Bar Bucks online at www.WynwoodBBQFest.com. For more information, visit www.WynwoodBBQFest.com. Follow SWARM on Facebook at Facebook.com/SwarmEventAgency and Instagram @SWARM_EventAgency. #GrillinNChillin. As Jungle Island works on reopening its park area with enhanced amenities, the park makes its comeback to The Wynwood Yard for an afternoon of hands-on animal interactions and community engagement. Jungle Island’s most well-known animals will make an appearance, along with surprise activations and experiential arts and crafts for kids. Climate Change Conference 2018 welcomes you to grace with your presence in the 7th International Conference on Climate Change and Medical Entomology to be held at Dubai, UAE during October 15-16, 2018. This conference will bring together climatology researchers, entomologists, climatologists, professors and scientists to discuss strategies for climatology and entomology globally. Climate change conference 2018 is designed to provide divergent and prevailing education that will gather climate and medical professionals familiar of the issues affecting the climate, health and come to the solution of climate affecting globe. Undoubtedly the participant at this climatology congress will be able to exchange with the best experts in the specialty and will return home with extensive knowledge. Pre-registration is recommended for faster entry. Please join us for a wonderful afternoon of education and excitement to raise awareness about the offshore drilling issue. On February 11th, from 1:00pm to 5:00pm we will be at the beautiful Surfcomber hotel in Miami Beach for CoastFest. Enjoy an afternoon of music, art, education, refreshments, and words from our incredible speakers. This event is free and welcoming to all. It includes plenty of kids activities and interesting things for the whole family, as well as opportunities to make your voice heard about the issue of offshore drilling on our coast. Want to take action sooner? Send in your public comment right now! We still have room if you would like to participate! Jungle Island returns to The Wynwood Yard for an afternoon of arts and crafts, as well as conservation education. Both the Jungle’s animal residents and its education team will be there to support the beautification projects throughout Miami and its local parks. Kids will be able to decorate and take home their very own binoculars with bird spotting guides to see the amazing wildlife found in Everglades National park. During the interactive event, Jungle Island’s education team will show guests how they can keep parks and oceans clean and give them an opportunity to pledge their commitment to conservation by becoming an “eco-warrior,” all part of the park’s mission to bring residents unique interactive animal experiences, while also promoting the conservation of both the animals and the planet. In Partnership with Miami-Dade County Government and Bike305 we present Miami Beach Ciclovía! We’re starting 2018 with #MBCiclovía on Sunday, January 21 by transforming Washington Avenue from 5 to 16 streets into a paved park for people of all ages to stroll, cycle, skateboard, rollerblade and enjoy a new experience and the businesses along Washington Avenue. Washington Avenue from 5 to 16 Streets will be closed to vehicular traffic during this event. For attendees traveling to the event by vehicle, you are encouraged to park at the garages on Collins Avenue at 7, 13 and 16 streets. – Fitness Classes with Crunch Fitness – Washington Ave.
Dr. Sandra Steingraber, co-founder of the Concerned Health Professionals of New York, will visit Miami-Dade College to educate the general public about the potential health threats related to fracking. New and unconventional drilling methods for oil and gas could have endless, catastrophic effects on South Florida. The Concerned Health Professionals of New York, along with Physicians for Social Responsibility, have issued multiple health compendiums on the over 500 peer-reviewed studies on the impacts of fracking. Dr. Steingraber’s visit coincides with the completion of the 5th version of the Compendium of Scientific, Medical, and Media Findings Demonstrating Risks and Harms of Fracking. On Thursday January 4th, 2018, the White House announced its plans to open nearly all U.S. federal waters to offshore drilling activities. In a new draft five-year program for oil and gas development, the Department of the Interior (DOI) outlined its plans to expand future oil and gas leasing to the Atlantic, Pacific and Arctic oceans, as well as the eastern Gulf of Mexico. This plan includes the possibility of drilling for oil DIRECTLY off Miami’s beaches in the straits of Florida. This is the largest number of potential offshore lease sales ever proposed. On January 25th at the City of Miami Commission Meeting, City Commissioner Ken Russell of District 2 will be introducing a Resolution opposing Offshore Drilling and Seismic Airgun Blasting. 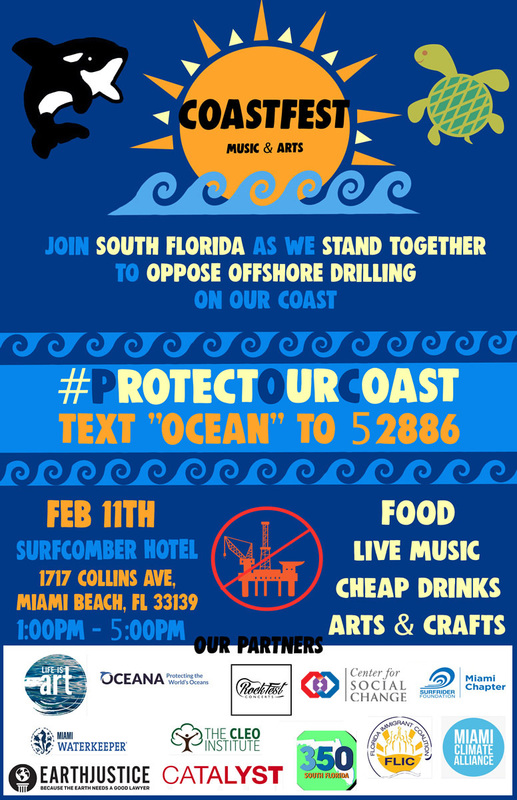 Miami Residents must attend to show the City of Miami how crucial it is to keep oil and gas drilling OFF our beaches. Join The Wynwood Yard and Debris Free Oceans on their mission to beautify Wynwood while also making an impact on Biscayne Bay and our Miami beaches where trash eventually makes its way from city centers, harming marine life and water quality. Meet at The Yard at 3 p.m. for a refreshment and to receive a reusable cup (included in ticket price and which will get you 50 cents back on every beer purchased ever at The Bar at The Yard), trash bags, gloves, pickers and directions. We’ll also learn about our local public lands, including Biscayne National Park, which celebrates its 50th anniversary this year. Then, travel through the neighborhood cleaning up as you go and making pit stops for a bite (at Fireman Derek’s Key Lime Pies) and an invigorating drink at local, participating businesses (included). Finish the cleaning, eating and mingling tour at The Yard with more refreshments. Proceeds raised will benefit Debris Free Oceans. Keg, Clean, and Compost in Wynwood! Join The Wynwood Yard, Debris Free Oceans, and Slow Food Miami for this month’s community keg, clean, & compost event! We will start at 2pm in the garden at the yard where we will enjoy beer compliments of Saltwater Brewery and tempeh from BeCultured Tempeh while we participate in a free 30 minute composting workshop by the The Worm Whisperer! Around 3pm, we’ll make our way through the neighborhood to cleanup our streets while grabbing complimentary snacks and refreshments at Zak the Baker and Fireman Derek’s Key Lime Pies along the way! We will end at the yard around 4:30 with live reggae music and more refreshments! The Wynwood Yard and Debris Free Oceans will be continuing with monthly community clean ups in the neighborhood throughout the year, teaming up with local non-profits and community partners. Last Early-Bird Walk of the season! Join us for an Early-Bird Walk in the Garden! Please remember to wear comfortable shoes, be ready to walk, and bring your binoculars! Please note that this program is seasonal. Group volunteer session at Fairchild! Join us for one of our group volunteer workdays from 9:00 am-12:00 pm on the dates listed below. Please plan arrive 15 minutes prior to 9:00 am to complete registration. Park and enter at the SOUTH entrance (Staff Parking Lot) and check in at the Garden House. Volunteer groups must be willing to get dirty and able to work in all types of weather. Closed-toe shoes are required and long-sleeved shirts, long pants, and a hat are highly recommended. Volunteers under the age of 18 must bring a signed parental consent form provided once registered. Volunteers under the age of 14 must be accompanied by a parent or adult chaperone and require a signed parental consent form. Individuals are welcome to join in on any of our group dates. Space is limited, so please e-mail volunteer@fairchildgarden.org to register your group today!